Recently I spoke to a customer about the humidity problems they were experiencing with their Evaporative Air Conditioner so it prompted me to write this article about how a dehumidifier can help. 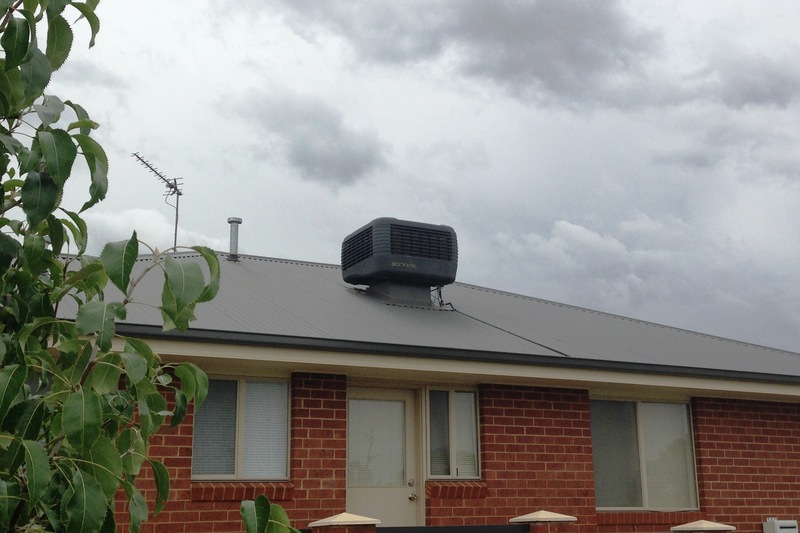 Many homes throughout Australia have Evaporative Air Conditioners. These types of air conditioners are very efficient and are an effective way to keep your home cool during the hot dry days of Summer. The Evaporative Air Conditioner is quite different to the common refrigerant type models. A large fan draws the hot dry air in to the AC unit which is located on the roof. As it draws air in it passes through wet honeycomb type pads which cools the air. The cool air is then ducted into each room of the house. Whenever it rains or even when its overcast the Evaporative Air Conditioner struggles to cool the home because the Relative Humidity can soar to as much as 80 – 90% inside. Therefore the home does not feel as cool as it should and the comfort level has become somewhat diminished. The Evaporative AC is then less effective; in fact it can make the indoor climate conditions worse. Everything in your home can start feeling damp and clammy like your bedding, flooring even the clothes in your wardrobes. In some cases it can lead to mould problems throughout your home. My wife Chris and I spend a lot of time in the NSW city of Wagga Wagga. This lovely city can be very hot and dry during Summer however lately they have experienced thunder storms, rain and high humidity. The Evaporative AC was working overtime until we started running our Ausclimate Dehumidifier. It removed a huge of the moisture/humidity therefore allowing the AC to function much more effectively. At one stage our NWT Large Home Dehumidifier was collecting an amazing 1 litre of water per hour and that was continuously over 2 days. Imagine that much water building up in your home! If you live in Sydney, Melbourne, Adelaide, Brisbane in fact anywhere in Australia and you find your Evaporative Air Conditioner is struggling with humidity consider using an NWT Dehumidifier from Ausclimate www.ausclimate.com.au . We’re sure you’ll feel the difference. Categories: tips | Tags: air conditioner, air conditioner humidity, dehumidifier australia, dehumidifier nsw, dehumidifier qld | Permalink.